Never forget you’re in paradise, not even for a moment, at this 2-bedroom, 2-bath vacation condo in the prestigious Hali’i Kai at Waikoloa Beach Resort. Fill your utopian vacation with walks along Waikoloa Beach, ocean-view golf, rejuvenating swims in the oceanfront pool, massages at the lava rock spa, and locally sourced cuisine at the Grill at Hali'i Kai. Golden Hawaiian afternoons are never better than on your private lanai facing the Hali’i Kai’s park-like tropical courtyard. Lounge in a hammock with a good book and the sun on your skin. Watch the kids play in the secluded courtyard, essentially your huge backyard at this ground-level condo. Meanwhile, the Resort’s 3 BBQ pits send up the scent of grilled dinner on the ocean breeze. Inside, the luxurious master features a king-sized bed and its own en-suite bath with a walk-in shower for indulgent mornings. The second bedroom has 2 twin beds, also could be converted to a King bed. Bring your kids or your favorite couple to join you on the Big Island! The convenient second bathroom is just down the hall. Pack light. Condo 21B at Hali’i Kai provides everything you need to enjoy your Big Island adventure including boogie boards, beach toys and towels, and all other linens. 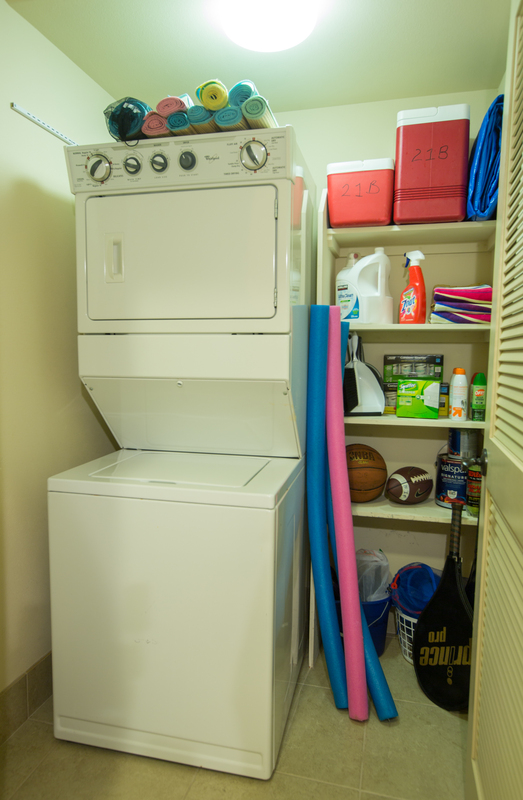 A washer and dryer are on hand to help you pack less as well. Not to mention the fully equipped kitchen, which is compact but very functional, with all major appliances, pots, pans, dishes, glasses and flatware. Sneak in a quick snack after the beach or prepare a full meal to savor at sunset on the lanai’s dining table. While you finish your after dinner glass of wine, let the kids escape to the landscaped courtyard to play in the twilight. You can easily keep an eye on them right on your lanai. The world-famous Waikoloa Beach Resort (of which Hali’Kai is a part of) is one of Hawaii’s most impressive oceanfront retreats. Here at Hali’i Kai, you can combine the unmatched amenities of resort vacationing with the privacy and perks of your own residential style condo. In addition to being close to the shores of Waikoloa Beach, you’re also just a short stroll from the pristine turquoise waters of Anaeho'omalu Bay (A-Bay). Be on the lookout for our sea turtle neighbors who often climb onto the lava rocks to sun. Active travelers will love the tennis court and basketball 1/2 court and the oceanfront fitness cabana. Discover why Waikoloa Beach Resort and the Hali’i Kai vacation condos and villas are among the Big Island’s sought after vacation accommodations. Email us today to begin your unforgettable Big Island getaway. Mahalo! Please note that the Hali'i Kai Resort collects a mandatory Resort fee of $20.00/day plus tax per day per household for all villas rented. The resort fee allows guests access to the Ocean Club facilities and includes electronic entry gate key card. The resort fee is subject to change at any time without notice. Kona has the most sunshine of all the islands. One week of wind & the other 5 were perfect. Our rental unit is perfect for us & an occasional guest. We so enjoy our garden space with 3 BBQ’s. So convenient. The pool & restaurant are fantastic as well. 10 minute drive to beautiful sand beach. We stayed here for 9 day’s in September. From the minute we arrived everything was perfect. The condo was exactly as pictured and exceptionally clean. The bed was so comfortable and the bathroom was beautiful. The appliances were new and the condo was stocked with everything we needed for our stay. They also supplied some beach gear and coolers which was a wonderful addition. We spent every morning on the lanai and it always felt like we had the entire development to ourselves. The condo and the development are extremely quite. The grounds are impeccably maintained. The pool area is resort quality and we spent many evenings watching the sunset there. The service we received from LUVA and Adriana was second to none. She responded to our texts quickly and did everything within her control to ensure we had our dream vacation. We can’t wait to come back and this unit and LUVA will most definitely be part of our future vacations. Thanks so much to the owners for sharing their little piece of paradise with us. What a beautiful place to stay while on the big island. We have stayed in many rental places along our travels and this place exceeded all expectations. The kitchen is stocked. 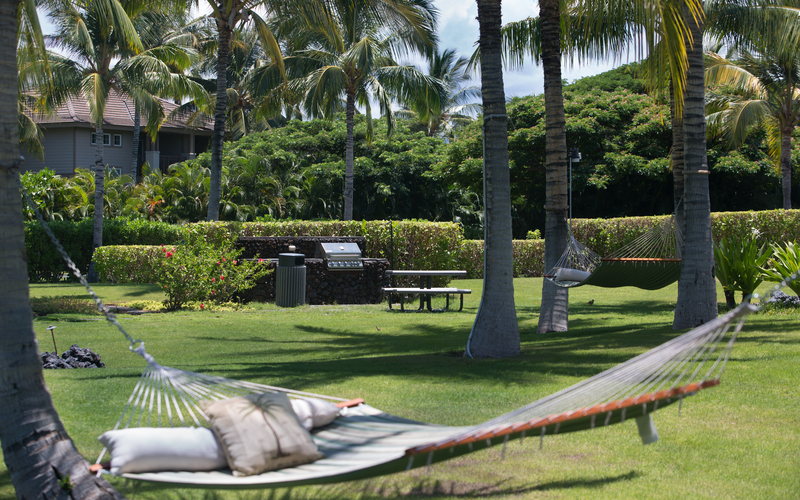 There is no bbq on the lanai, but the communal bbqs are located a few steps away from the lanai (including a comfy hammock). The unit does with 5 tommy bahama beach chairs, beach umbrellas, pool noodles, 4 boogie boards, beach towels, beach mats, coolers, snorkel gear and sand toys. There were also tennis rackets available as well. Adriana from the property management company was very easy to book with and prompt in responding to questions. This unit is located in building 21 which is closer to the front gate. It's about a 10 minute walk to the ocean club. The ocean club is very nice and relaxing with ocean views. Lots of pool chairs, a fitness centre and a bar to enjoy maitais and kona beer. Happy hour is fabulous at the pool club. I would recommend this unit, it is very comfortable and relaxing.